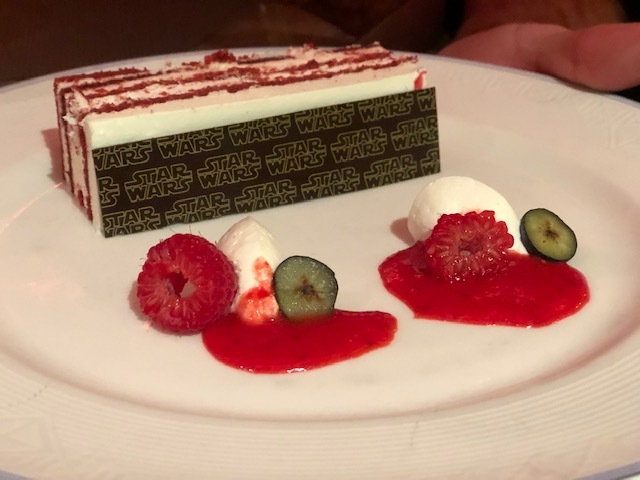 Star Wars Day at Sea 2019 Review - Believe Vacations | Dream It. Do It. It seems like everyone in the continental United States is freezing cold this weekend. Some have snow outside, some record low temperatures and others just needing a little heat in the house. So what better time to have one of our agents share her recent experience on a Disney Cruise, right? Meet Kristen Brown! Kristen has been with our team for 6 months and recently stepped off the boat of the Disney Fantasy after 7 nights in the Western Caribbean. And if you were not jealous enough, this particular voyage happened to be a part of the Star Wars Day at Sea out-of-this-galaxy experience. No doubt staying warm from the memories she’ll have forever, she took time to tell us about her experiences just a few days after returning home. Have you ever been on a Disney Cruise before? Yes! We sailed on a Very Merrytime Cruise on the Dream in 2016 and became “hooked”! We knew after that trip that we wanted to go longer than 4 nights! I would’ve gotten the itch to go back after 2 years myself. When did you book your trip? I booked this trip very last minute as a Christmas gift for our family instead of toys! We often like to choose experiences over things and I found a great last minute deal booking this trip a month before travel! Even though we booked last minute we were still able to do everything we wanted to do! I’m a big fan of the “experiences” as presents as well. You mentioned this cruise included the Star Wars Day At Sea. Do you even like Star Wars? It’s not that we don’t “like” Star Wars, but no we are not “Star Wars people.” I have never seen a movie! But I have to admit Stars Wars Day at Sea was a HUGE deal to many people on board! I can safely say out of all that good information so far, the take away was YOU HAVE NEVER SEEN A STAR WARS MOVIE?! We need to talk after this article, young lady! But staying with the cruise, did you decide to do any of the fish extender/guest exchange things that happen on board? I joined the Facebook group for our cruise shortly after booking and the fish extender groups had already been established. I personally wasn’t going to participate anyway because it basically requires ALOT of time as people really go all out and do personalized gifts, etc. I also didn’t want to have to pack an extra suitcase of 7 nights worth of gifts! How was the weather for a January cruise? We lucked out with AMAZING daytime weather! Sunny and warm! The evenings on the ship up on deck 11 were windy and a little chilly. The ocean waters were pretty cool at Castaway Cay but we swam anyway! We had to do the the Pelican Plunge!! What non-Star Wars things did you enjoy? Only one day of the cruise was Star Wars so we ENJOYED alot! We saw great Broadway-caliber Disney-themed shows, rode the Aquaduck, did the on-board Mid-Ship Detective Agency scavenger hunt several times, and saw magic shows, one included my husband was hypnotized on stage by Ricky Kalmon. We also met a ton of characters and attended character dance parties and listened to live music in the atrium each night. And for your kids? They loved the meals, enjoyed the towel animal surprises each night, visited the Oceaneers Club and did some fun crafts. We all participated and watched family karaoke, went to a magic class with the magician who was onboard, ate a lot of ice cream cones, and sooooo much more! The options are endless on board! This doesn’t even include our amazing port adventures! Disney cruises are known for their amazingly themed restaurants. Which one was the favorite for the Brown Family? We did not do either of the “adults only” restaurants, but our favorite was Animator’s Palate. Great food and super fun atmosphere! We all got to draw a character and they made them come to life on the TV screens throughout the restaurant! Did you get to enjoy any of your different ports you stopped at? Cozumel- We took a jeep tour with a locally owned company. Adriana took us to a tequila tasting, a great calm swimming spot in the ocean for the girls (where we got to see a crocodile in the lagoon across the street), snorkeling, and lunch at the beach! It was an amazing day! Grand Cayman- We booked an excursion to Sting Ray City, snorkeling and starfish beach stops. The water was really rough that day so it was really hard to enjoy Sting Ray City with the rough water but it was really neat to see! Starfish beach was awesome and there were starfish everywhere in the water! Falmouth, Jamaica- For our day in Jamaica, we booked a relaxing day at an all inclusive resort called Royalton White Sands. It was a short bus ride from the port and was INCREDIBLE! They had a water park with slides for the kids, a fabulous beach, swim-up bar, huge pools, a lazy river and of course great included food and drink! Castaway Cay- My husband ended up doing the Sting Ray Experience here since the water was so rough in Cayman. We wanted to do the jetski tour but they were all cancelled due to rough waters where they take you. Castaway is a great day as everything you need is right on the island! They serve lunch as well. We took advantage of everyone being off the ship and went back on for lunch. The ship was so quiet and we were able to ride the Aquaduck over and over and enjoy the pools in private for an hour or so before we went back out to Castaway. Okay, Mrs. “Never Seen Star Wars,” what Star Wars stuff did they have for you to enjoy? There were Stars Wars characters on “pool patrol” off and on all day, characters I didn’t know walking around the ship, BB-8 races in the atrium, Star Wars crafts for families and kids, Star Wars movies played all day on the Funnel Vision at the pool and in the movie theater, and the food offered for the day was all Star Wars themed with some really cool desserts! Our favorite was the Darth Vader cupcake! Was the entire boat decorated like a planet from Star Wars or was it still mostly the gorgeous boat? There were very little Star Wars decorations. The day of Star Wars Day at Sea, they decorated in the atrium a little and had a photo spot, but that was it. They also left a Star Wars banner in our stateroom on the end of our bed at turn down as a gift. The towel animal on Star Wars day in our room was YODA! What kind of Character Meet and Greets were there? Character meet and greets happen ALL day on a Disney Cruise. There is a schedule of appearances posted on a digital screen in the atrium and it is also available in your paper navigator. We personally used the Navigator on the app so that we could see the whole week’s schedule of events and plan ahead to make sure we saw all we wanted. As far as Star Wars characters, there were TONS! But I have no idea who most of them were! I did know Chewbacca, Darth Vader, BB-8, R-2 D2, Ray, Princess Leia. They were all out walking around the ship all day. NO IDEA?! I almost cried seeing Chewbacca at Hollywood Studios! But you did mention the entertainment. Describe some of the shows that happened on deck or on stage. With Star Wars Day At Sea, we got two nights of fireworks instead of one! Fireworks happened on pirate night and Stars Wars day! We didn’t watch the stage show for Star Wars day on the pool deck, but there was one! Star Wars themed names. Dinner was Star Wars themed and there was a huge selection of Star Wars themed desserts!! Did you and/or your family dress up? We did not dress up for Star Wars but we were the minority! We did pirate night! Kristen, you’ve been awesome recapping this adventure. Any final thoughts or advice for future cruisers? A Disney Cruise is an absolute amazing experience! Beach, sun, and adventure sprinkled with Disney Magic and the Disney Difference! We were spoiled! I also want to comment on the cleanliness of a Disney ship. You never see trash. The bathrooms have attendants at all times cleaning up. You are required to sanitize or wash your hands before entering ANY and ALL food areas and there are cast members there making sure you do so. Even at the ice cream station! The staff is top notch and always making sure you have what you need. The restaurant servers even cut up our kids food for them! They go above and beyond to make sure you are comfortable and have what you need (or want ) at all times! We are already looking forward to the next one! And I’m sure you would be happy to book your next one and the first for someone who wants to have the same magical experience you did. Thanks Kristen! So, who’s ready to leave this cold weather and go on a Disney Cruise? Whether it’s themed like Star Wars or even Marvel or the wonderful tried-and-true traditional voyages, our agents are ready to help you plan your next cruise. Until then, remember there’s a great, big, beautiful tomorrow!